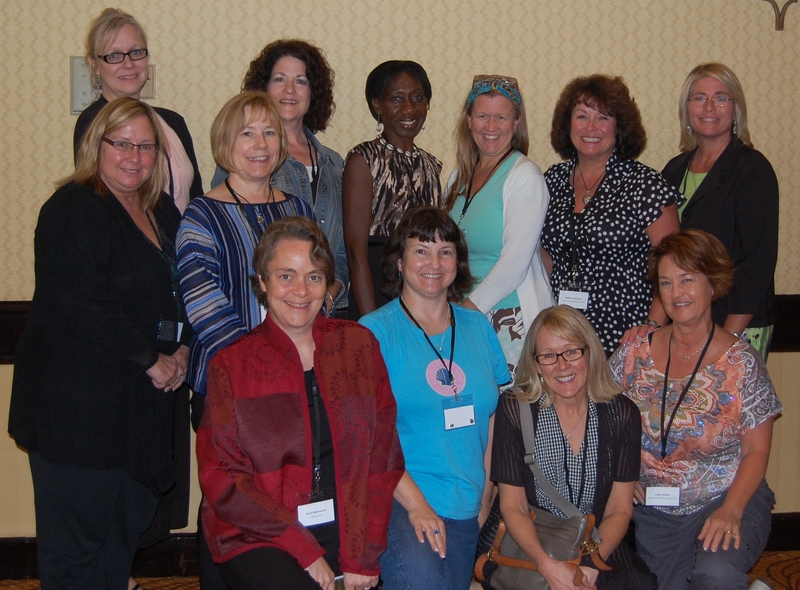 IBCLCs gathering at the recent NICHQ Region B conference in Baltimore. Each hospital has a “core team” that includes a senior administrator, at least one physician, a nurse leader, a bedside nurse, a data manager, a team leader, a senior lactation consultant, and a mother who does not work for the hospital and has given recently given birth at the hospital. This model addresses administrative “buy-in” issues by requiring senior administrator participation. In fact, the senior administrators have their own track tailored especially for their needs. Since creating a community that supports breastfeeding is a goal of Baby-Friendly, involving a mother from the community makes so much sense! Recently, hospital core teams from “Region B” gathered in Baltimore, MD for a two day learning session (and Baltimore’s famous crabcakes on our own!). National public health leaders such as CDC’s Laurence Grummer-Strawn and Charles Homer, MD, MPH, president of NICHQ and on faculty at Harvard University, kicked off the event and energized the crowd. Over the course of two days, participants learned more about why breastfeeding is so important, how hospital practices make a difference, and what teams can do to transform the culture. We heard specifics about Baby-Friendly designation directly from Trish Mac Enroe and Liz Westwater of Baby Friendly USA. ILCA members Lori Feldman-Winter, MD, MPH, IBCLC and Anne Merewood, PhD, IBCLC provided specific strategies for success. Pediatrician Sahira Long, MD, gave insights into providing culturally appropriate care. We learned Continuous Quality Improvement (CQI) techniques that are essential to measure our baseline, develop strategies for change and chart our progress as we strive to support breastfeeding from the prenatal period, throughout childbirth and the hospital stay, and into the postpartum period. Finally, we heard from hospitals in our region who have already become Baby-Friendly as they shared trials and triumphs that we could all relate to. Each participating hospital made a “story board” or video about their hospital, their goals, their successes, and challenges. Pennsylvania Hospital Core Team members enjoyed seeing what others have done and were proud to share our history of “rooming-in” dating back to 1765! 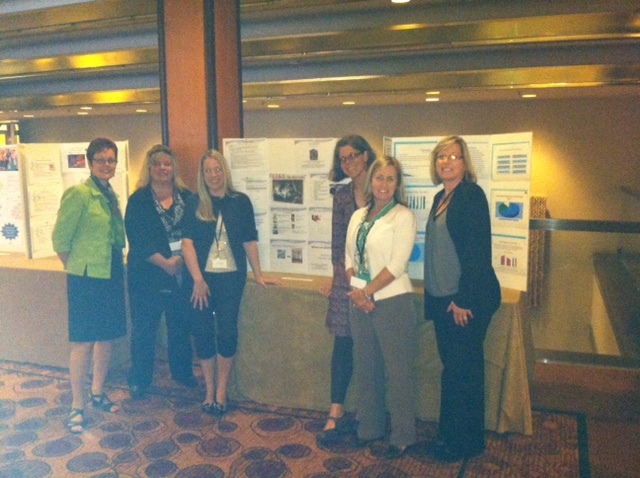 Debi Ferrarello, Susan Meyers, Brittany Stofko, Kelly Wade, Pam Powers, and Karen Anastasia in front of their hospital story board. So what do IBCLCs need to know about this initiative? IBCLCs need to know that after years of pushing that boulder up the mountain alone, there is suddenly an army of folks pushing right along with us…And we need to welcome the newcomers to the task. We need to be prepared to graciously play support roles as leaders who may never before have considered breastfeeding suddenly “discover” it. Many of the hospital team leaders are IBCLCs, meaning that we need to quickly become experts in CQI tools that were never part of The Exam and develop the essential skills to effectively lead an interdisciplinary team through a complex and multi-layered transformation. This is challenging work, but then again, IBCLCs have always be up for a challenge! Best Fed Beginnings brings opportunities for IBCLCs. In order to become Baby-Friendly, hospitals need to make sure that all of their nurses have at least 20 hours of breastfeeding education, including five hours of competency-based demonstration. IBCLCs can teach classes and conduct skills labs for the competency education. While hospitals are not required to employ IBCLCs for Baby-Friendly designation, many do hire IBCLCs to care for their patients, as well as to provide education for other staff members. And finally, as hospitals invest resources into breastfeeding support, the visibility of those with expertise in lactation care rises. IBCLCs become far more valuable in the eyes of the hospital and the community. This is all good for IBCLCs, and ultimately for mothers and babies! Debi Ferrarello, MSN, MS, IBCLC is honored to lead the NICHQ Core Team for the nation’s first hospital—Pennsylvania Hospital in Philadelphia. Over the years she has worked in private practice, co-founded the nonprofit communty-based Breastfeeding Resource Center with Colette Acker, IBCLC, and led hospital-based lactation programs. She conducts breastfeeding-related research, writes and speaks about breastfeeding, and is passionate about breastfeeding as public health. She currently serves on the board of the United States Lactation Consultant Association.